On a memorable day in late April I arrived at the river with a guest who was intent on fishing for trout and looked at my 13’ double handed fly rod as if I was mad. Once I pointed out the superior line control, lack of disturbance and added backbone should I find one of the said elusive ‘Monsters’ he shrugged his shoulders and made his way up river in search of trout. I tied on a 1” Black Francis on a copper tube and proceeded to fish my way down river searching out all of the likely spots. As with many small rivers this is not repetitive step and cast fishing but a constant battle to stay concealed and not send any fish in the area fleeing after a bad cast. Fish are rarely spotted in their lies here as the water at this time of the year has a slight cloudy tinge to it. I fished down through various runs, deep pools and undercut banks providing a rich variety of lies for would be ‘monsters’ but to no avail. The day was overcast and the sounds and smells of late spring were everywhere, the Kingfisher whistled as if flew like a little blue dart over the river and the otter prints were evident in various places along the shallows. Unfortunately at about lunchtime my blissful dream like state was smashed as my Fiancee arrived. My preferred approach of stealth, cunning and guile was replaced by step, cast, chat, answer questions about decorating etc etc. I decided that the best option would be to continue fishing down to a rather promising pool below the footbridge before calling it a day. There is a lie under the fence post at the bottom of this pool that often holds a fish. I worked my way down gradually dropping the fly next to the tall reeds at the far bank and mending the line to ensure a nice deep slow swing bringing the fly fluttering across the deep lie at a perfect speed. Nothing happened. I was not surprised as I’d been told “no one catches anything here until the spinning starts, its not worth the effort!” as I fished on optimistically I thought I’d lengthen the line a bit and cover the shallower tail of the pool. “Just a couple more casts!” I shouted to the now rather bored and increasingly impatient Fiancee. After putting out my last cast to the far bank I let the fly swing and was about to reel in when I caught a glimpse of something out of the corner of my eye. Was it a swirl or just the current? I thought the best course of action would be to put out just one more cast in case there was something there. As the fly landed by the reeds an upstream mend was put in to let it sink a little. The fly stopped, the line pulled slowly with the unmistakable feel of a head shaking. Pike, I thought, a huge silver flash confirmed that this was no Pike! My pulse begin to race, this was not a typical Frome fish. 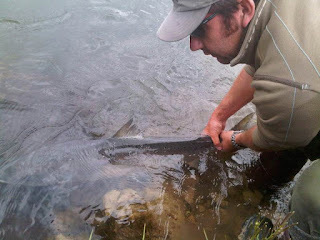 I had landed fish up to 18 lb the year before and this was a lot bigger. My eight weight rod did little to check the first run of this fish as it forged upstream towards the footbridge. This was not looking good, I could not get round this bridge if the fish continued its run. Thankfully after tightening the drag right up the fish turned and dropped back into the main pool. My fear of losing the fish increased every time the join in the multi tip line rattled through the tip ring. My Trout fishing friend arrived a few minutes into the battle and was put in charge of the net. As the banks were high and my nets man was used to small fish and big nets I was beginning to wonder if this was a bad move. After numerous strong, determined runs the fish surfaced once more and I realised that it was about twice as long as the net, this was going to be interesting. Eventually the fish started to tire, the odds were looking back in my favour . The fish continued to hug the bottom but was now staying close to where we planned to net it. The first bungled attempt to get the fish it the net resulted in my shouting and swearing pointing out that it should be netted head first not tail first! Landing this would be nothing short of a miracle I thought. The next attempt to net the fish head first failed miserably as the fish wriggled and came out of the net backwards spelling disaster. I could picture the fly stuck in the net as the fish flopped out . Amazingly the fish was still on and the fly was still firmly lodged in it's scissors. After much stern direction from myself the now tired fish finally made its way into the net. I breathed a huge sigh of relief and a warm glow overtook me, although my heart was pounding hard and fast. My prize, a beautiful, fresh, hen fish was finally in the net against all odds. Without hesitation I jumped in to the cool river well over the top of my wellies to attend to my fish. The hook was carefully removed and the fish slid out of the net to steady her until she recovered. I was in utter disbelief, what a fish, one of the fabled multi sea winter Frome fish was laying there before me. At 41” this was my biggest Salmon by far and one I will always remember. My catch was reported to the Scientists who operate the fish counter and as it had its adipose fin clipped it was likely to be tagged on it’s outward journey as a smoult. I was more that happy when I had an email from Luke at the Lab with a video clip of a 41” fish making its way through the counter. Only 2 fish of that size were recorded through the counter that year. The question in the back of my mind is, was it one of the last of the remaining big Frome fish, or one of the first of a recovering run? Great Start to the weekend!